Since I was 12 years old and first realized a writer’s words (books, poems, essays) can actually be extended independently to a broader audience, I have remained fascinated with the possibility of the Idea being received before rather than after Proximity. Therefore, many of you (visitors to the site who have never met me) will be inclined to respond to the latest postings, or to offer your own ideas – please do so, for if this were not dialogue, I could simply write a white paper and publish it on my website. Agree where you can, disagree where you must, you are invited to engage in any manner suited to the topic(s) at hand. Every reader’s perspective creates a new entity. Like the photon experiments or Schroedinger’s Cat or the wave/particle definition, these stories now exist in your minds, in your universes, and with every new reading, the Idea expands, takes a different shape, a different meaning. In my opinion, it is not a matter of physical travel, but of synchronous thought. It is not a matter of proximity in space, but rather, proximity in time, and the possibility that one may move along one’s path in ZigZag form (with apologies to Ted N. for the use of his term in a different context) or in years that are cubes positioned side-by-side. Imagine our chronology of thought as a Grid, infinitely matrixed, multi-directional, affording many more plotlines (Q Narratives) than merely A->B->C. 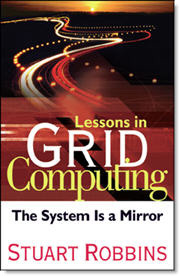 Consider the consequence of computing services (University of Illinois) that can answer questions before they are asked.